This study was designed to compare baseline data and clinical outcome between patients with prostate enlargement/benign prostatic hyperplasia (PE/BPH) who underwent unilateral and bilateral prostatic arterial embolization (PAE) for the relief of lower urinary tract symptoms (LUTS). This single-center, ambispective cohort study compared 122 consecutive patients (mean age 66.7 years) with unilateral versus bilateral PAE from March 2009 to December 2011. Selective PAE was performed with 100- and 200-μm nonspherical polyvinyl alcohol (PVA) particles by a unilateral femoral approach. Bilateral PAE was performed in 103 (84.4 %) patients (group A). The remaining 19 (15.6 %) patients underwent unilateral PAE (group B). Mean follow-up time was 6.7 months in group A and 7.3 months in group B. Mean prostate volume, PSA, International prostate symptom score/quality of life (IPSS/QoL) and post-void residual volume (PVR) reduction, and peak flow rate (Qmax) improvement were 19.4 mL, 1.68 ng/mL, 11.8/2.0 points, 32.9 mL, and 3.9 mL/s in group A and 11.5 mL, 1.98 ng/mL, 8.9/1.4 points, 53.8 mL, and 4.58 mL/s in group B. Poor clinical outcome was observed in 24.3 % of patients from group A and 47.4 % from group B (p = 0.04). PAE is a safe and effective technique that can induce 48 % improvement in the IPSS score and a prostate volume reduction of 19 %, with good clinical outcome in up to 75 % of treated patients. Bilateral PAE seems to lead to better clinical results; however, up to 50 % of patients after unilateral PAE may have a good clinical outcome. This work reflects in part the work from Bilhim T. Embolização das artérias prostáticas no tratamento da hiperplasia benigna da próstata. PhD thesis, Faculdade de Ciências Médicas, Universidade Nova de Lisboa, Lisbon, Portugal, May 2011. Preliminary studies have shown that prostatic arterial embolization (PAE) for the relief of lower urinary tract symptoms (LUTS) in patients with prostate enlargement/benign prostatic hyperplasia (PE/BPH) is a promising, new, minimally invasive, image-guided therapy [1, 2, 3, 4]. 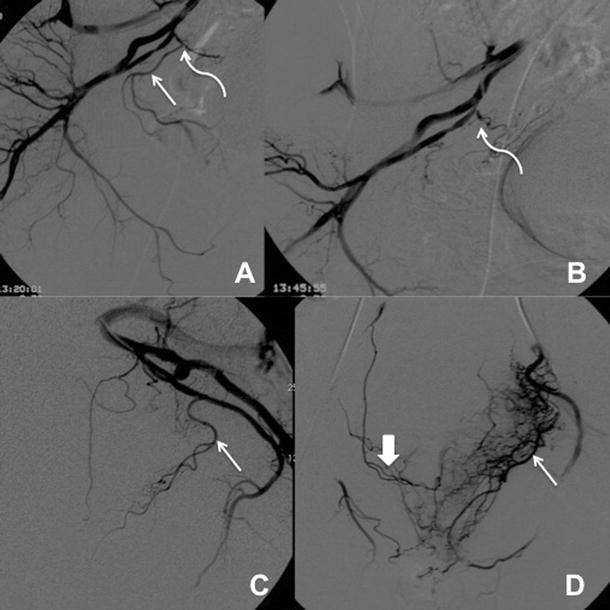 However, PAE is a technically challenging procedure with unilateral embolization and technical failure reported rates of approximately 10–15 and 7 %, respectively [1, 2, 3, 4]. To perform the procedure in a safe manner without nontarget embolization to periprostatic tissues, precise knowledge of the male pelvic and PA anatomy and imaging findings is required [5, 6, 7]. One of the reported series [2, 4] included one patient with unilateral embolization (with almost 20 % reduction in prostate volume and 11 % PSA reduction) and another with bilateral PAE (with almost 50 % reduction in prostate volume and 82 % PSA reduction). Both patients had significant clinical relief. Another series  showed that unilateral PAE might lead to moderate clinical relief with 8 % prostate volume reduction and 18 % reduction in PSA. However, the preliminary case report described a patient who underwent unilateral PAE with 38 % prostate volume reduction, 90 % decrease in PSA, and significant clinical relief . We found no study to date that has compared the results between unilateral versus bilateral PAE in the treatment of LUTS in patients with PE/BPH. The purpose of this study was to compare baseline data and clinical outcome between patients who underwent unilateral and bilateral PAE for the relief of LUTS. This single-center, ambispective, cohort study compared 122 consecutive patients who underwent unilateral versus bilateral PAE from March 2009 to December 2011 (mean patient age 66.7 ± 7.2 years) with PE/BPH who underwent PAE for the relief of LUTS or for the treatment of acute urinary retention (AUR). The institutional review board approved the study, and a signed informed consent was obtained from all patients. All patients were evaluated by clinical observation measuring the severity of LUTS with the international prostate symptom score (IPSS) and the quality of life (QoL) related to LUTS. Erectile function was evaluated with the International Index of Erectile Function (IIEF). Prostate volume (PV) assessment was performed by digital rectal examination (DRE) and 2D-transrectal ultrasound (TRUS) using the ellipsoid formula π/6 × (transverse diameter × anteroposterior diameter × sagittal diameter). PSA was measured in all patients. Uroflowmetry measuring the maximum flow rate (Qmax) and the postvoid residual volume (PVR) was performed in all patients who were not experiencing AUR. 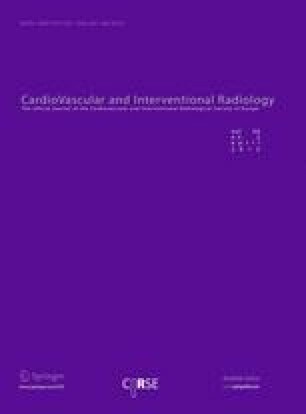 Pre-procedural sectional imaging planning with CT angiography (CTA) to evaluate the feasibility of PAE and study the pelvic arterial anatomy was performed in all patients [5, 6, 7]. If the PSA level was greater than 4 ng/mL or when the DRE or TRUS findings were suspicious, prostatic biopsy was performed to exclude malignancy. Inclusion criteria for PAE included male patients, age >40 years, prostate volume >30 cc, and diagnosis of PE/BPH with moderate to severe LUTS refractory to medical treatment for at least 6 months (IPSS >18 and/or QoL >3) or under acute urinary retention refractory to medical therapy. All patients were receiving medical therapy with one alpha-1-adrenergic receptor antagonist (alfuzosin 10 mg, Ratiopharm, once daily; doxazosin 4 mg, Cardura Gits, Pfizer, once daily; or tamsulosin 0.4 mg, Ratiopharm, once daily). Thirty-one patients (25.4 %) also were medicated with 5-alpha-reductase inhibitors (finasteride 5 mg, Proscar, Merck Sharp & Dohme, once daily; or dutasteride 0.5 mg, Avodart, GlaxoSmithKline, once daily). Four patients had previous prostatic surgery (TURP) years before. Sixteen patients (13.1 %) were experiencing AUR before PAE. Exclusion criteria included malignancy, large bladder diverticula (>5 cm), large bladder stones (>2 cm), chronic renal failure (glomerular filtration rate <60 mL/min; serum creatinine >1.2 mg/dl), tortuosity and advanced atherosclerosis of iliac and/or prostatic arteries (PAs) on pre-procedural CTA (on the basis of visual evaluation by the interventional radiologists), active urinary tract infection, and unregulated coagulation parameters. All patients were evaluated with IPSS/QoL, IIEF, PV, PSA, Qmax, and PVR measurements. Baseline data were assessed, and response to treatment was evaluated 1, 3, 6, and 12 months after PAE. Our procedure protocol has been described previously . We asked patients to stop all prostatic medication 1 week before embolization, if they were able to tolerate it. If the procedure was clinically successful, patients were told to abandon all prostatic medication after PAE. Two days before PAE, in the day of PAE and on the following 10 days, patients were medicated with an acid-suppressing drug (omeprazole 20 mg, Bluepharma, once daily), an anti-inflammatory (naproxen 1,000 mg, Naprosyn, Roche, twice daily), and an antibiotic (ciprofloxacin 750 mg, Jaba, twice daily). Patients were admitted to the hospital on the morning of the procedure and were discharged the same day if no complications occurred. During PAE analgesic and anti-inflammatory drugs were given intravenously (ketorolac 30 mg and metamizol 2 g). A unilateral femoral approach (under local anesthesia) was performed with a 5F 11-cm-long hydrophilic sheath (Cordis, NJ, USA). A pigtail catheter (F5, Cordis) or the Roberts uterine artery catheter (Cook, Bloomington, IN) was introduced in the femoral artery with a 0.035′ hydrophilic guidewire (Terumo, Tokyo, Japan) to perform the crossover. Afterwards, the Waltman loop was reformed on the Roberts uterine artery catheter that was used to catheterize both hypogastric arteries. The catheter tip was left in the proximal part of the anterior division of the hypogastric arteries and digital subtraction angiography (DSA) using nonionic optiray contrast medium (Ioversol, 350 mg I/ml; Covidien, Dublin, Ireland; 6 mL, 3 mL/s, 3 frames/s) was performed with ipsilateral anterior oblique projection (35º) and caudal-cranial angulation (10º). Afterwards, the prostatic vessels were selectively catheterized with a 2.4–2.7 F-microcatheter (Cantata, Cook; Progreat, Terumo, Tokyo, Japan) and a 0.016′ guidewire (Sagitta, Cook; Glidewire GT, Terumo). Selective prostatic artery DSA was performed manually with 3-5 mL of contrast volume in neutral and ipsilateral anterior oblique (35º) and caudal-cranial angulation (10º) projection. Selective PAE was performed with 100- and 200-μm nonspherical polyvinyl alcohol (PVA) particles (Cook). The endpoint for embolization was interruption of the arterial flow to the prostate, reflux, and prostate gland opacification. Procedure time (starting with femoral puncture access and finished after removal of the catheter) and fluoroscopy time were measured. Pain was measured using a visual analogue scale (VAS; 0 = sensation of no pain; 10 = worst pain), by verbal questioning and written questionnaires during and in the 6–8 h following PAE. Postembolization symptoms and complications were registered and classified according to the quality improvement guidelines for percutaneous transcatheter embolization . All patients were evaluated by clinical and physical examination with pain assessment in the day after PAE and weekly in the following months. Poor clinical outcome after PAE was considered when one criterion was met: IPSS ≥20 and/or reduction <25 %; QoL ≥4 and/or reduction <1; Qmax improvement <2.5 mL/s; additional treatments required (need of prostatic medication or surgery due to persisting severe LUTS) [9, 10]. For comparisons of baseline and outcome variables between the two groups, the paired t test and Fisher’s exact tests were used. For comparisons of the change from baseline of outcome variables between groups, an analysis of covariance (ANCOVA) with adjustment for age was used. For the comparison of poor clinical outcome, logistic regression adjusted for age was used. Reported values are means and standard deviations. Statistically significant differences were assumed at p < 0.05. Stata software release 12 (Stata Corporation, College Station, TX) was used for all statistical analyses. Bilateral PAE was performed in 103 (84.4 %) patients (group A). The remaining 19 (15.6 %) patients underwent unilateral PAE (group B). Mean follow-up time was 6.7 months in group A (1 year in 30 patients; 6 months in 43 patients; 3 months in 23 patients; and 1 month in 7 patients) and 7.3 months in group B (1 year in 10 patients; 6 months in 2 patients; 3 months in 7 patients). Most patients who underwent unilateral PAE had significant atherosclerotic lesions and tortuosity of the iliac and prostatic arteries or prostatic arteries that arose from the superior vesical artery with angled origins and tortuous trajectory (Figs. 1, 2, 3). Patients in group B were significantly older than patients in group A (Table 1); however, no other statistically significant differences were found in the baseline data between groups. Overall, mean procedural time was 83.7 min (range 26–182) with a mean fluoroscopy time of 27.8 min (range 8–61). In group A, the mean procedural time was 67.3 ± 30.9 min, and it was 96.3 ± 26.4 min in group B (p = 0.0007). The mean fluoroscopy time was 18.1 ± 12.9 min in group A and 34.0 ± 10.3 min in group B (p < 0.0001). Mean procedural pain score was 3.1 and 0.2 points after PAE (before discharge), with 15 (12.2 %) patients discharged the following day (inpatients) because of personal preference (the remaining patients were treated as outpatients and were discharged 6–8 h after PAE). As minor complications, 12 (9.8 %) patients had urinary tract infections after embolization treated with antibiotics (10 patients from group A—9.7 % and 2 patients from group B—10.5 %), transient hematuria in 16 (13.1 %) patients, transient hemospermia in 8 (6.6 %) patients, and transient rectal bleeding in 10 (8.2 %) patients that disappeared spontaneously without any treatment during the first 2 weeks. There were two cases of balanoprostatites (1.6 %) and nine inguinal hematomas (7.4 %) that required no additional treatment. Two patients had acute urinary retention after PAE; for relief, a temporary bladder catheter was placed at the time for a couple of hours and the patients were able to void spontaneously before discharge. No other minor or major complications were observed. Sixteen patients were under AUR before PAE (13 from group A and 3 from group B) and all were able to remove the bladder catheter and urinate spontaneously 15–60 days after PAE. Overall, there was a mean prostate volume reduction of 18.2 ± 22.1 mL (19.2 %, p < 0.0001), a mean PSA reduction of 1.73 ± 4.33 ng/mL (30.9 %, p < 0.0001), a mean IPSS/QoL improvement of 11.3 ± 8.74/1.93 ± 1.52 points (44.8 %/44.2 %, p < 0.0001), a mean Qmax improvement of 4.00 ± 4.75 mL/s (65 %, p < 0.0001), and a mean PVR reduction of 35.9 ± 93.2 mL (0.5 %, p = 0.002). The IIEF improved 1.55 ± 6.44 points (23.6 %, p = 0.017). There was a statistically significant difference between groups regarding clinical outcome with 47.4 % of patients from group B and 24.3 % of patients from group A having poor clinical outcome (23.1 % difference, p = 0.04). Age was a confounder and after adjusting for age, this trend was maintained but did not reach statistical significance. There were no statistically significant differences in the improvement rates of most evaluated parameters after PAE between groups (Table 2). The PV volume reduced more 7.9 mL, the IPSS 2.9 points, and the QoL 0.6 points in group A. The PSA, Qmax, and PVR improvements after PAE did not differ significantly between groups. There were 34 (27.9 %) patients with poor clinical outcome after PAE (25 from group A—24.3 % and 9 from group B—47.4 %). Six patients underwent subsequent prostatic surgery (5 from group A—4.9 % and 1 from group B—5.3 %), whereas 20 patients resumed prostatic medication and remained under observation (13 from group A—12.6 % and 7 from group B—36.8 %). The remaining eight patients (7 from group A—6.8 % and 1 from group B—5.3 %) had significant IPSS and QoL improvements (requiring no additional medical or surgical therapy) but were considered to have a poor outcome based on the Qmax results (without improvement). Poor clinical outcome after PAE based on symptomatic parameters and on the need for further treatment was observed in 18 patients from group A (17.5 %) and 8 patients from group B (42.1 %) (unadjusted p value of 0.03; age-adjusted p value of 0.2). Overall, based on clinical symptomatic parameters and on the need of further treatment, poor outcome after PAE was observed in 26 (21.3 %) patients. These differences were not statistically significant between the two groups (Table 3). Pelvic arterial embolization to control severe bladder or prostatic hemorrhage due to neoplasms after biopsy or surgery has been reported in the past three decades with hundreds of patients treated with success. It has proved to be a safe and effective technique to control refractory, life-threatening bladder, or prostate bleeding. The procedure should be considered the treatment of choice, because it obviates the need for emergency surgery in severely ill patients [11, 12, 13, 14, 15, 16]. Animal studies have reported that PAE is a safe technique, inducing PV reduction, prostatic infarction, and ablation without sexual dysfunction [17, 18, 19]. The first report of PAE inducing LUTS relief was in a patient with BPH (unfit for surgery) with severe prostatic bleeding requiring multiple blood transfusions, refractory to interstitial laser ablation, and external-beam radiation. PAE stopped the hemorrhage and induced significative LUTS relief, PV, and PSA reduction . Based on these reports, it has been suggested that PAE might follow uterine artery embolization for fibroids . The preliminary results in 16 patients with PE/BPH and severe LUTS/experiencing acute urinary retention have shown that PAE is safe and feasible procedure, with short- and mid-term follow-up suggesting good symptom control without sexual dysfunction, associated with a reduction in PV and PSA. PAE is considered technically challenging and unilateral PAE has been reported in all of these preliminary studies [2, 3, 4]. In the present study, 15.6 % of patients underwent unilateral embolization due to significant atherosclerotic lesions and tortuosity of the iliac and prostatic arteries. All of the preliminary data results from single-center, small-sized studies. To our knowledge, we found no studies comparing unilateral and bilateral PAE in a large series of patients. We aimed to analyze retrospectively the baseline data between groups to see if there was any clinical predictor of unilateral PAE. We excluded patients with large bladder diverticula, because these are patients at high risk of poor outcome after embolization due to bladder dysfunction. Also, large bladder stones and large diverticula should be removed surgically to avoid possible complications (hematuria, bladder cancer). Age was the only baseline parameter that was statistically significantly different between groups. Older patients were at greater risk of unilateral PAE and were more likely to pose technical difficulties (probably due to greater tortuosity and atherosclerotic changes of the pelvic arteries). Although there was a greater rate of diabetic patients with unilateral embolization, this trend did not reach statistical significance. The mean procedural and fluoroscopy times were significantly larger in patients with unilateral PAE reflecting the technical difficulties (mean procedural times of approximately 1 h for bilateral PAE and 1.5 h for unilateral PAE; mean fluoroscopy times under 20 min for bilateral PAE and approximately 30 min for unilateral PAE). We prospectively compared clinical outcome between patients with unilateral and bilateral embolization. As expected, clinical outcome was better in patients with bilateral PAE. However, approximately 50 % of patients with unilateral embolization had a good clinical outcome, whereas 75 % of patients with bilateral embolization reported a good clinical outcome. As previously shown [6, 7], there may exist anastomoses between prostatic arteries from both pelvic sides, which may partially explain these results. 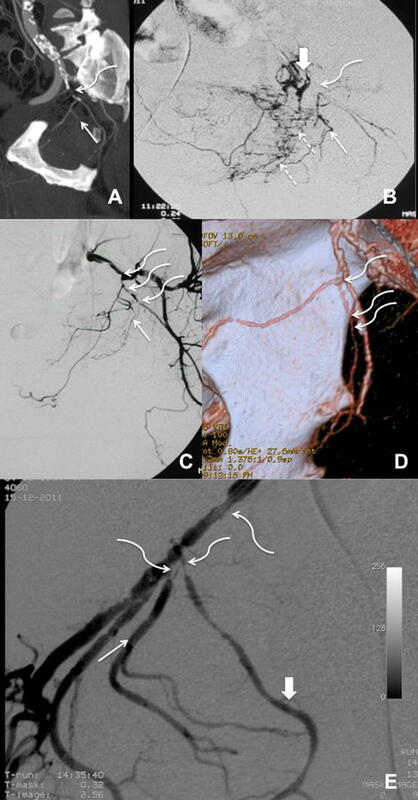 Overall, all of the evaluated parameters improved significantly after PAE. There was a mean IPSS improvement of 11.3 points (44.8 %), and a mean QoL improvement of 1.93 points, with a prostate volume reduction of 19.2 % and a PSA reduction of 30.9 %. Almost all of these changes were better after bilateral PAE; however, the differences between groups did not reach statistical significance. There was a greater IPSS/QoL improvement and PV reduction after bilateral PAE; however, the PSA reduction, the Qmax improvement, and the PVR reduction were slightly better after unilateral PAE (non significant differences). We believe that this is due to the fact that LUTS in PE/BPH patients is very complex and may be caused by many factors. Also, there is a short follow-up time. However, the great variability of the results in both groups (unilateral and bilateral PAE) may be one of the main reasons why these differences did not reach statistical significance. Unilateral PAE may be one of many confounding factors that undermine the clinical outcome after PAE for PE/BPH. The relief of the bladder obstruction did not follow the magnitude of clinical improvement (mean Qmax improvement of 4.0 mL/s; mean PVR reduction of 35.9 mL). This is not surprising, because PAE does not remove prostatic tissue. The IIEF had a slight improvement (1.55 points) probably due to the discontinuation of all prostatic medication after PAE. We were able to perform PAE as an outpatient procedure in almost 90 % of patients with minimal pain associated and no vomiting or other postembolization symptoms. No major complications were reported in this study, and all minor complications could be addressed with medical/conservative care. Approximately 30–40 % of patients experience a burning sensation in the urethra and irritative voiding (frequency, urgency) in the first 2 weeks after PAE. These symptoms may range from light to very severe and may raise the suspicion of a urinary tract infection (we only considered those cases with positive urine cultures). Patients should be warned that this is a normal finding after PAE and that is usually self-limited, disappearing after the first 2 weeks. We did not consider these symptoms as minor complications. We had approximately 10 % of urinary tract infections despite the antibiotic coverage before and after PAE (with no differences between groups). Up to 27.9 % of patients had poor clinical outcome after PAE. If the Qmax criteria were neglected and only symptomatic parameters were evaluated (IPSS/QoL and the need of further prostatic treatment), poor outcome after PAE was observed in 21.3 % patients. After unilateral PAE, 11 % of patients (n = 1) had significant IPSS/QoL improvements and required no additional treatments but were considered to have poor outcome due to the Qmax criteria. The same applied to 28 % of patients (n = 7) after bilateral PAE, with no significant differences between groups. Once more, the dissociation between clinical and urodynamic improvements partially explains these results. Most of the patients with poor clinical outcome remained under observation and resumed the prostatic medication with only six (4.9 %) patients needing to undergo surgery. The patients with good clinical outcome remained without any prostatic medication. This study has limitations. The follow-up time is not very long (and different between groups), and we did not compare PAE with other therapeutical options or placebo. There were no pressure-flow urodynamics performed (which may help to exclude patients with LUTS due to other causes such as bladder dysfunction), and the study was not randomized. The endpoint follow-up period in each group and between groups was not the same for all patients. PAE is a safe and effective technique that can induce 45 % improvement in the IPSS score and a prostate volume reduction of 19 %, with good clinical outcome in up to 75 % of treated patients. Bilateral PAE seems to lead to better clinical results; however, up to 50 % of patients after unilateral PAE may have a good clinical outcome. Tiago Bilhim and Hugo Rio Tinto—Cook Medical (speaker/honoraria; consultant/advisory board). João Pisco, Lúcia Fernandes, Luís Campos Pinheiro, Marisa Duarte, José A. Pereira, António G. Oliveira and João O’Neill—no conflict of interest.